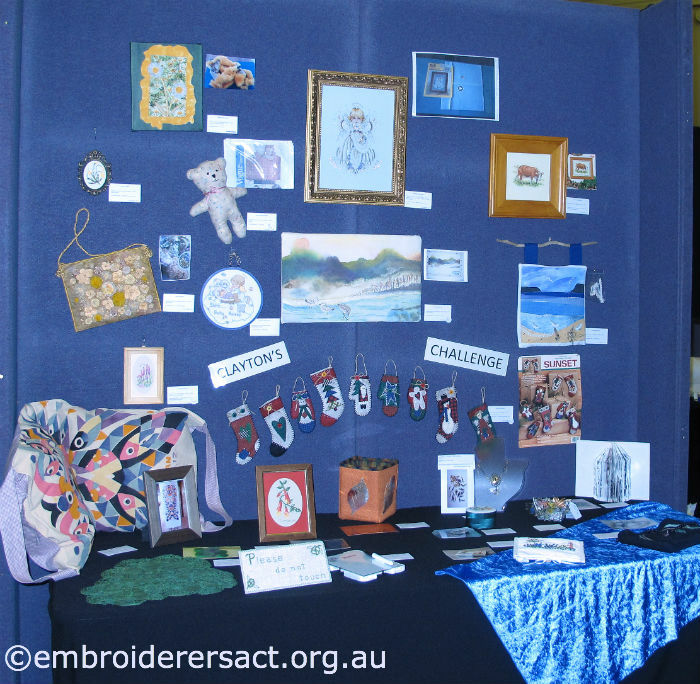 A quick post to share some of the awesomeness that was the opening of our Annual Exhibition last night plus a couple of pieces of stitchy goodness. 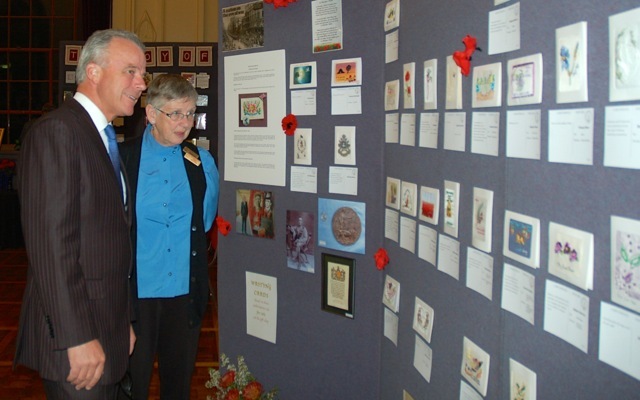 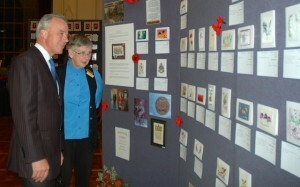 The Exhibition was opened by Dr Brendan Nelson AO, Director of the Australian War Memorial and he gave a fantastic speech that gave the evening a real buzz. 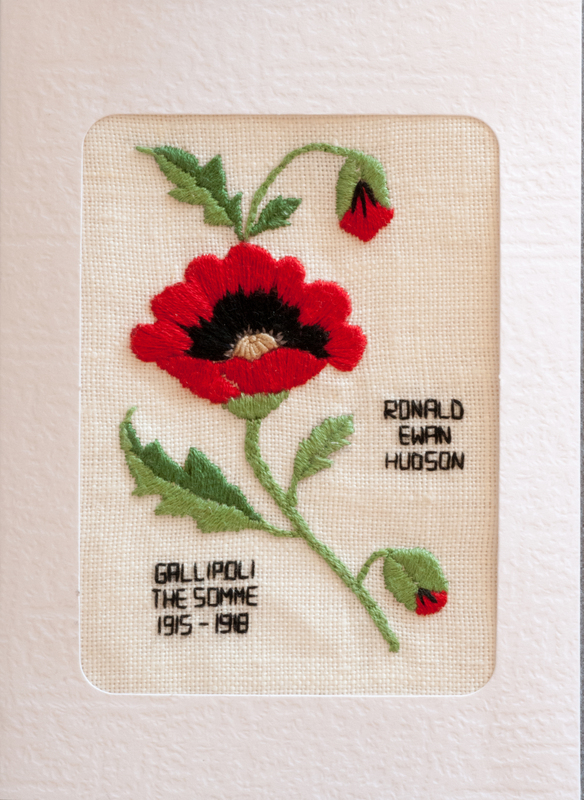 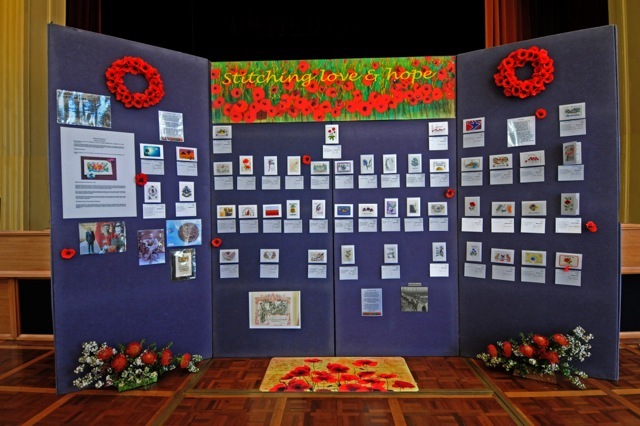 Here’s one of the postcards – an exquisite Flanders Poppy stitched by Glenda Hudson in honour of a family member. 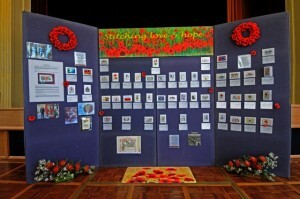 Very poignant and beautiful. 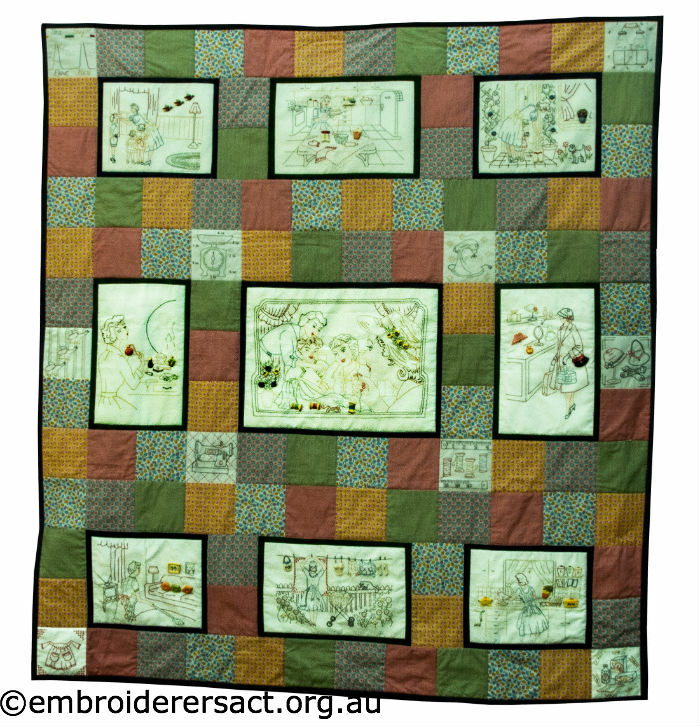 The blocks are from a Block of the Month series called The Sewing Circle by Robyn Allen-Waters. 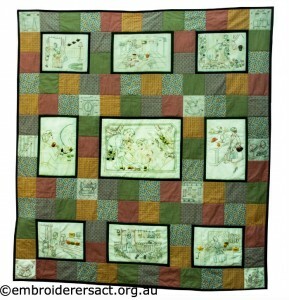 Susan made the quilt with 1950s reproduction fabrics. 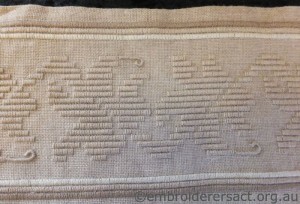 These and the blocks give this quilt a real mid century modern feel. 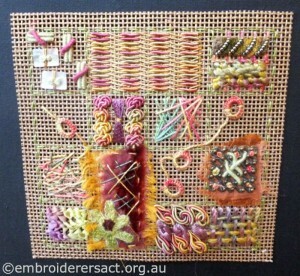 Here’s some wonderful eye candy of a selection of the blocks…. 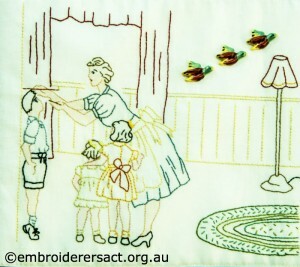 Those wall ducks are so cool and so ‘in’ at the moment. 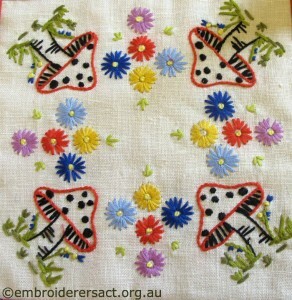 The retro vibe of these stitcheries is really fun and the colours are so 50s. 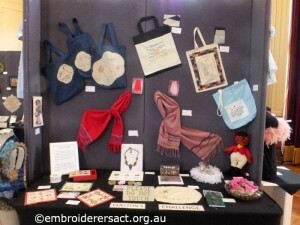 We have a very active recycle table here at the Guild in Canberra. 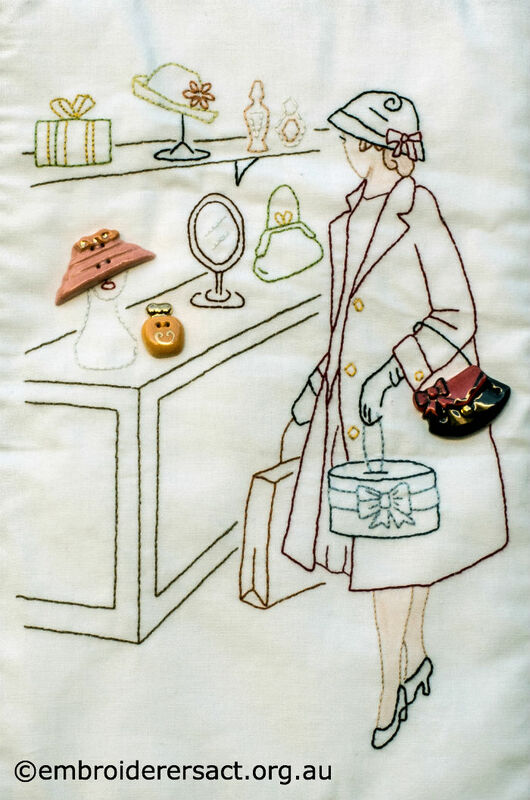 It’s haberdashery heaven! 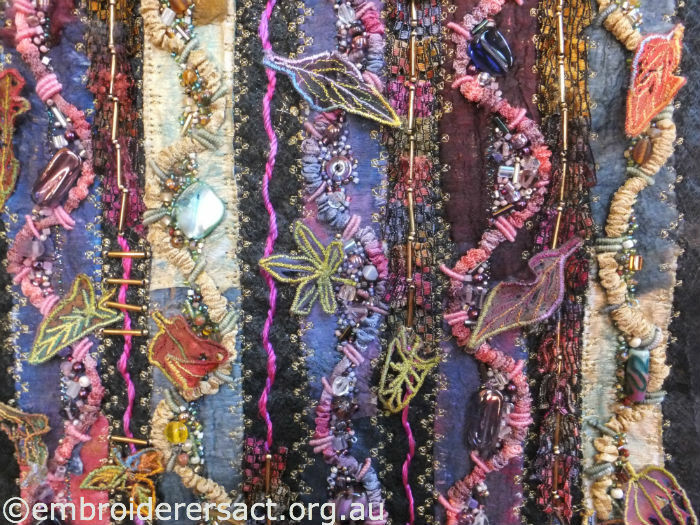 Doreen G and her team become magicians when they re-stock it – suddenly there are members everywhere rummaging through the piles of threads, fibres, fabrics, vintage patterns and embroideries, beads and bling – it’s all action and like watching a scene on fast forward. 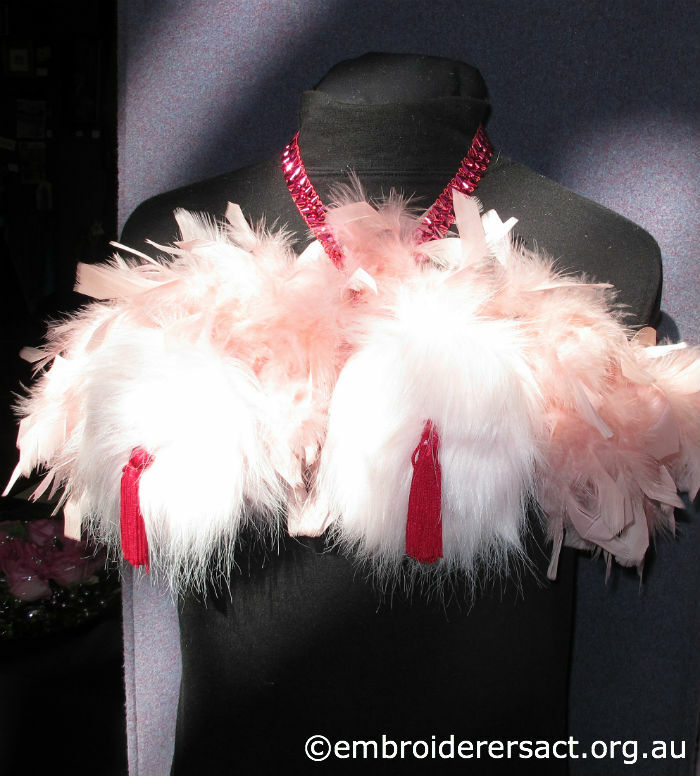 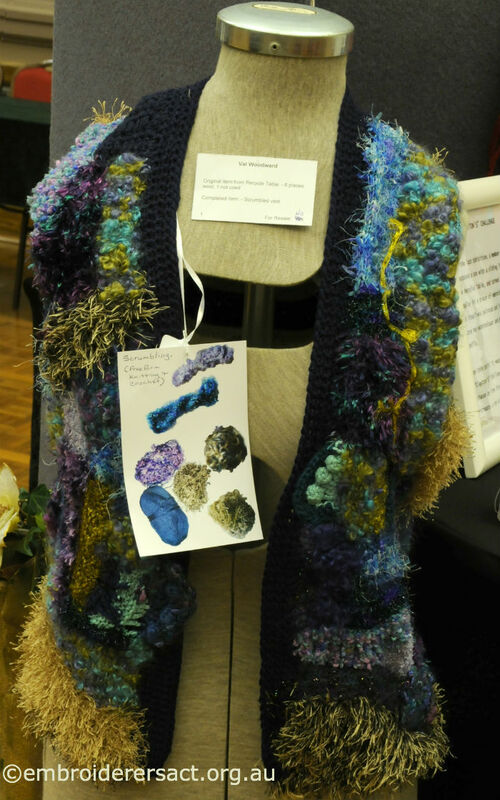 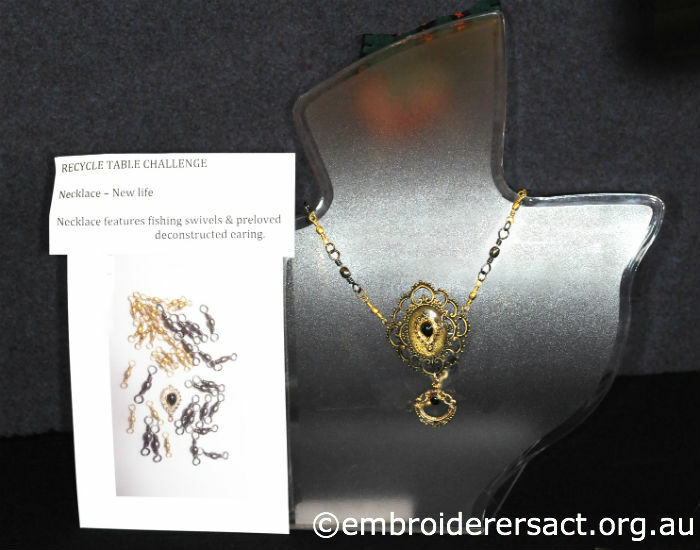 Earlier in the year Doreen G issued a challenge to everyone – to upcycle something(s) from the table and show them at the Exhibition. 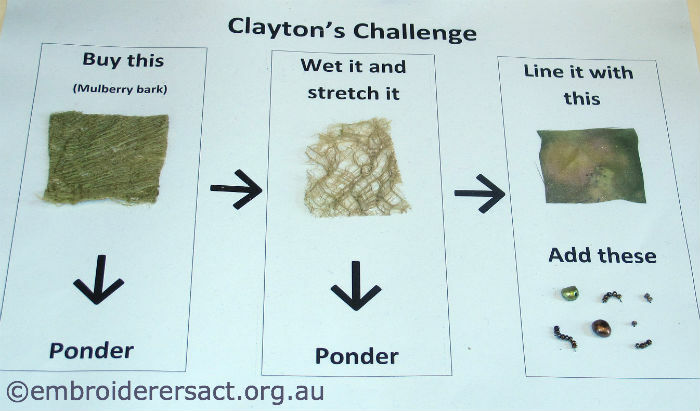 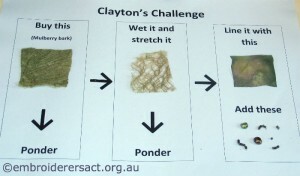 She called it a Clayton’s Challenge because it wasn’t one of the Guild’s formal Challenges. 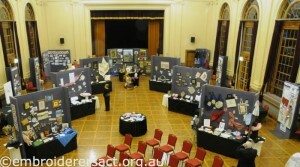 So here’s what everyone made for the Exhibition. .….And now to show you some of the works in more detail. 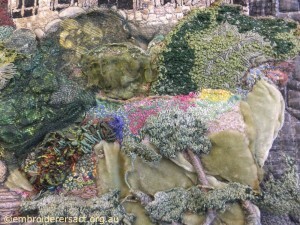 If you want to see any photo in greater detail just click on it to enlarge. 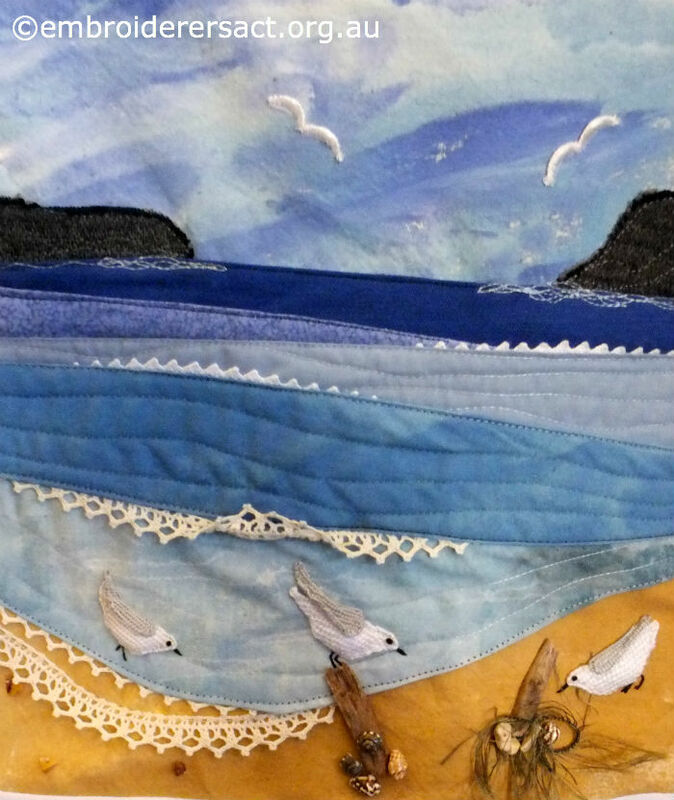 Lyn B took a piece of fabric on which someone had painted an atmospheric backdrop of mountains, cloud and sky and turned it into this evocative seascape. 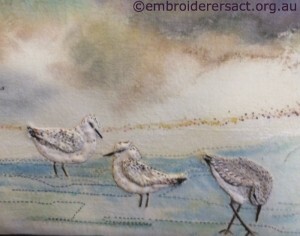 Don’t you think her sandpipers have real personality? 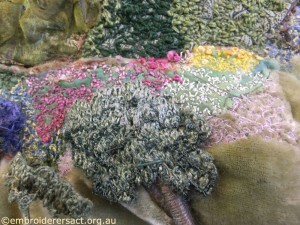 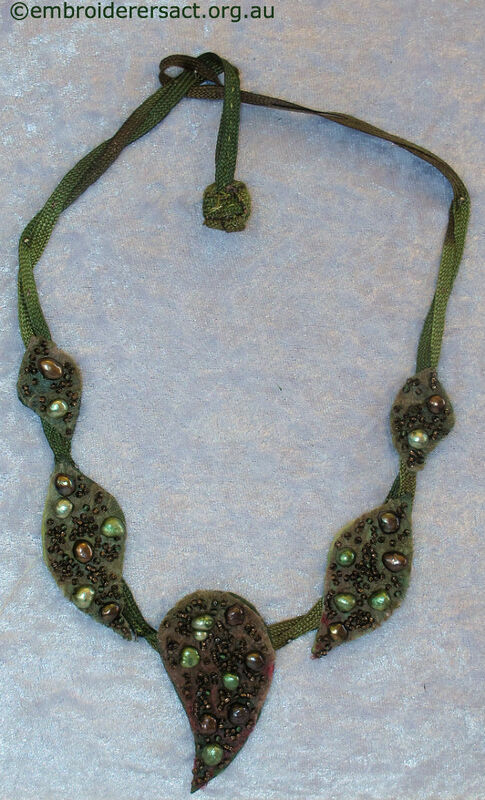 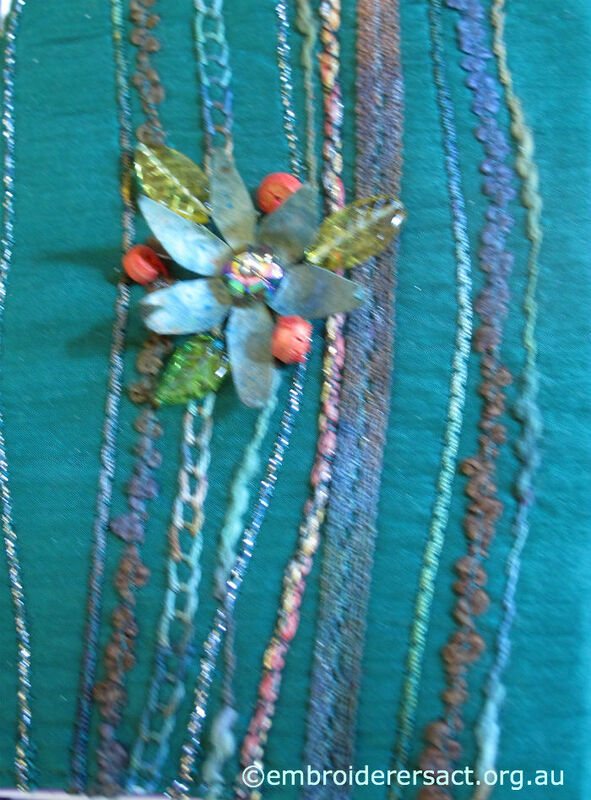 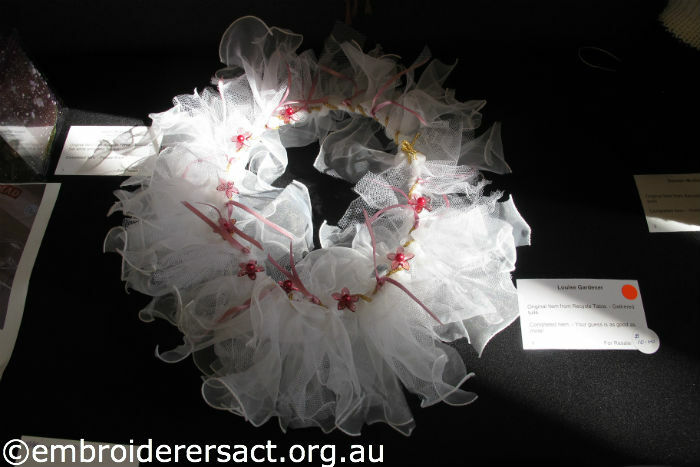 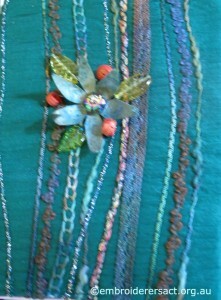 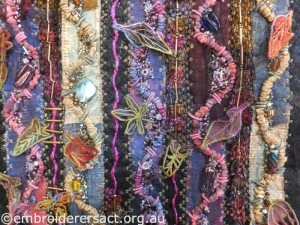 Christine B found some scraps of lace and they morphed into this bright scene..
what is it? 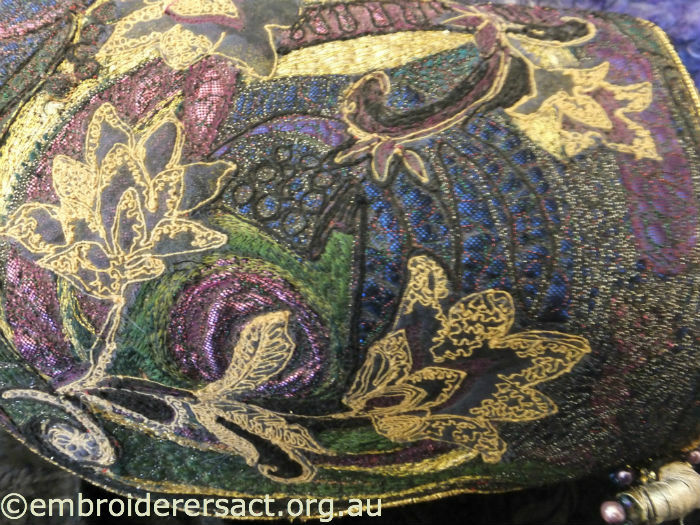 you ask – ‘Your guess is as good as mine’ says Louise! 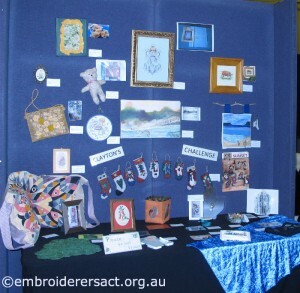 The Guild’s 2013 Exhibition is on right now. 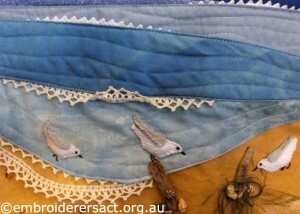 in the space of a few hours. Amazing! 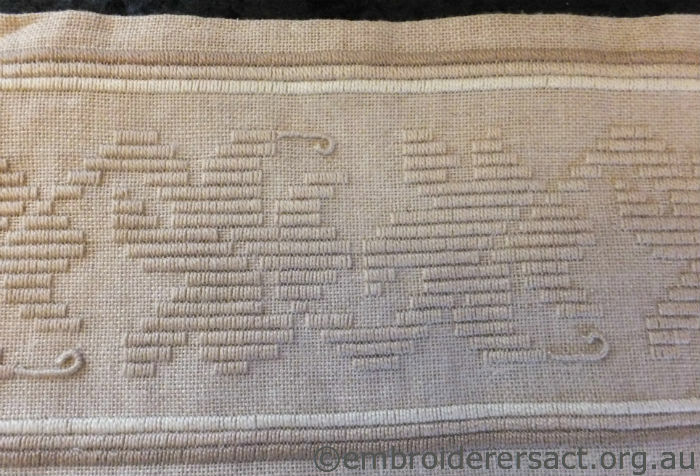 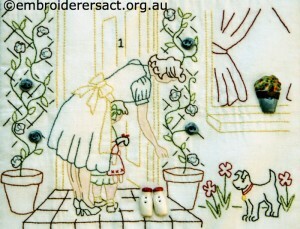 Haven’t they done some awesome stitching? 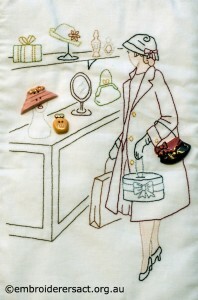 A special feature of this year’s Exhibition is a retrospective of the work of Caroll Pichelmann. 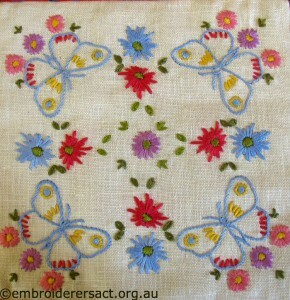 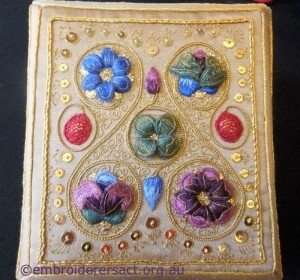 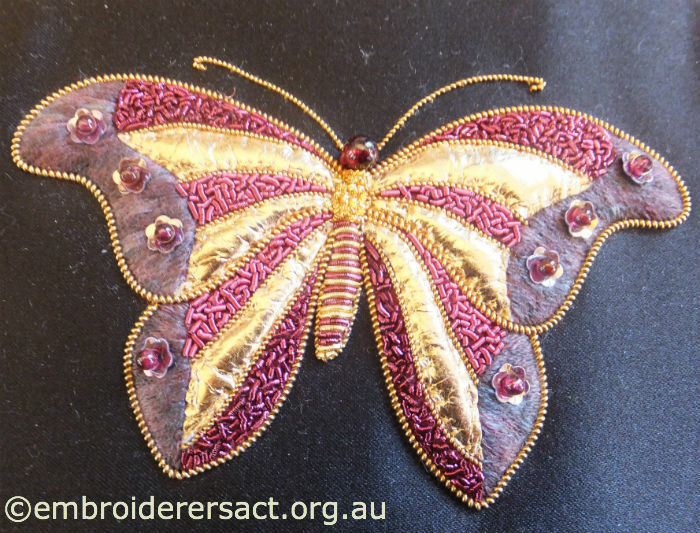 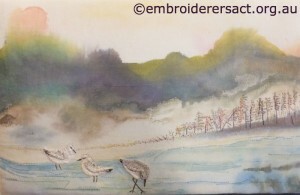 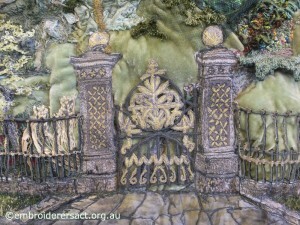 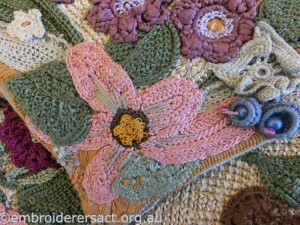 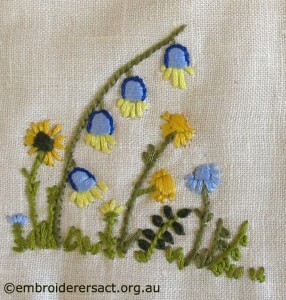 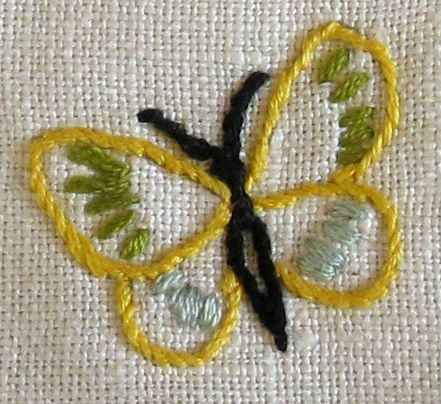 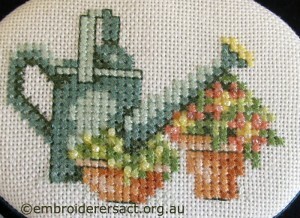 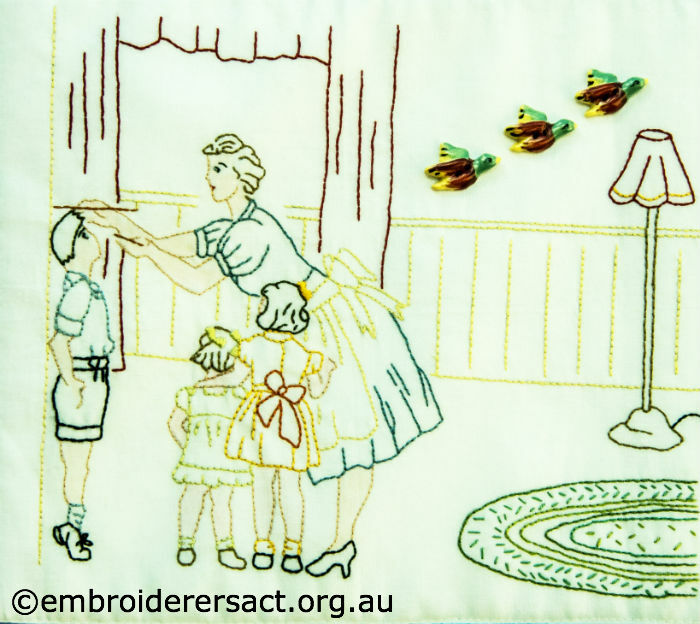 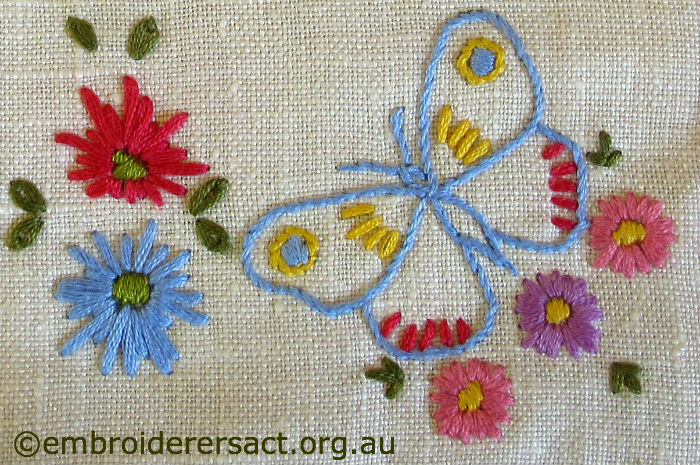 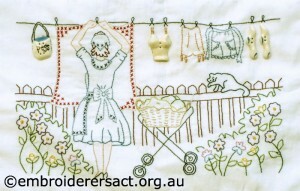 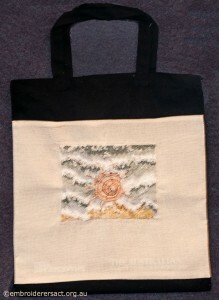 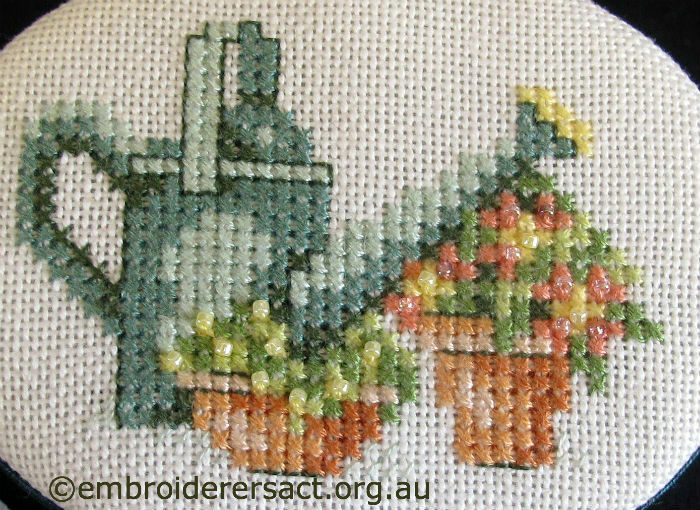 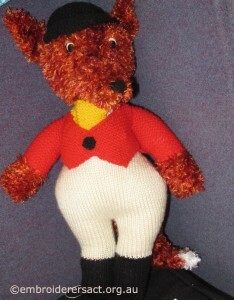 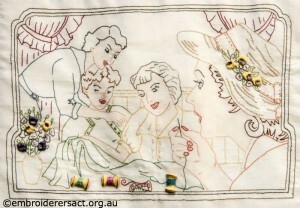 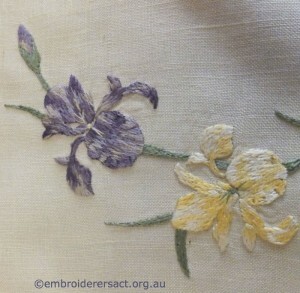 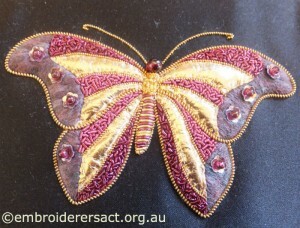 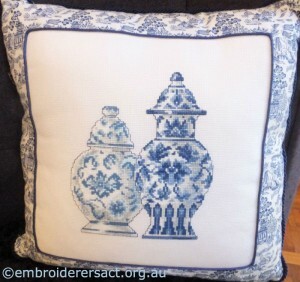 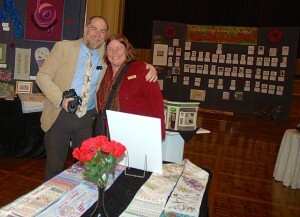 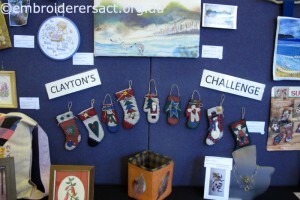 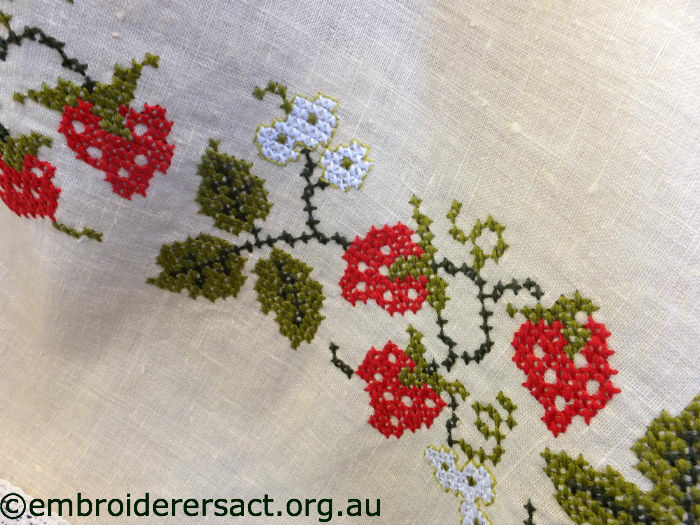 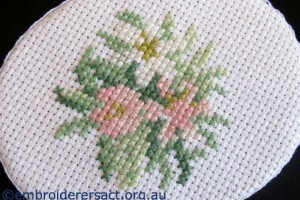 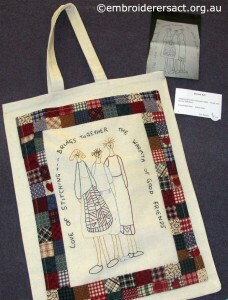 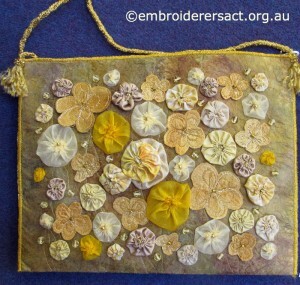 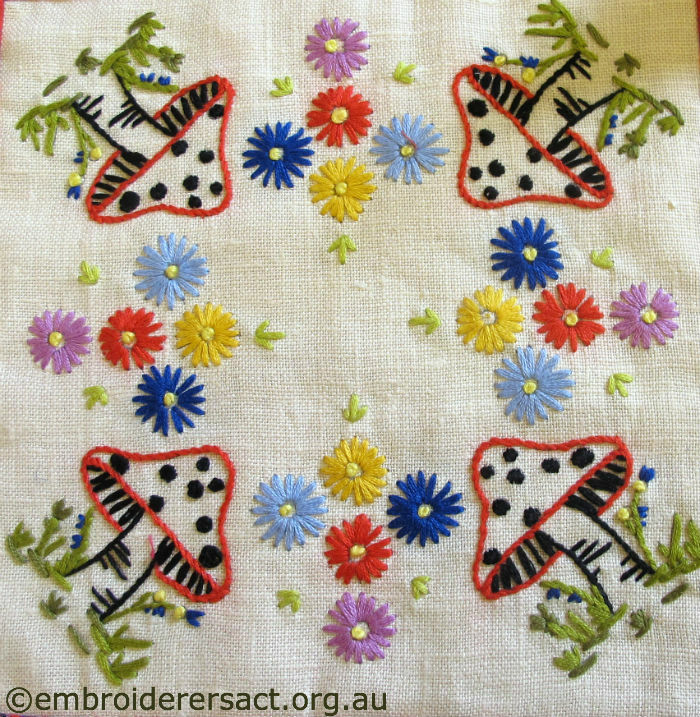 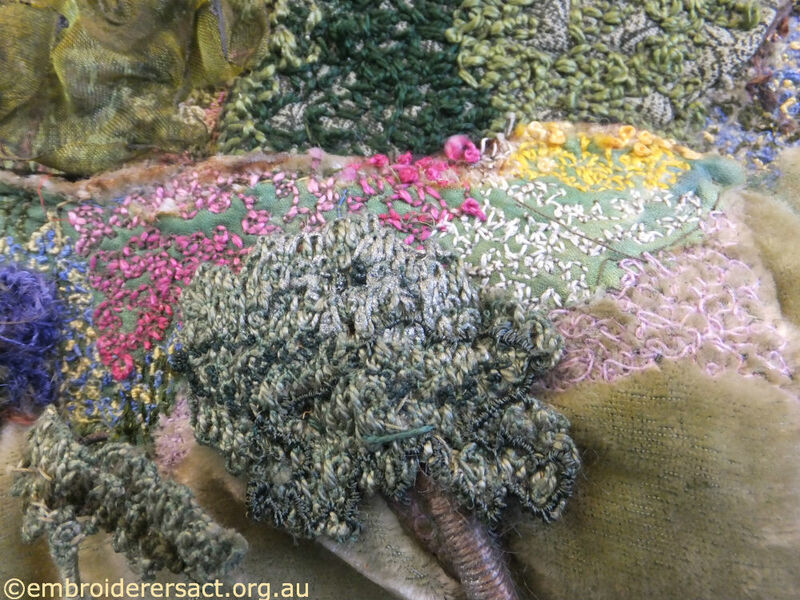 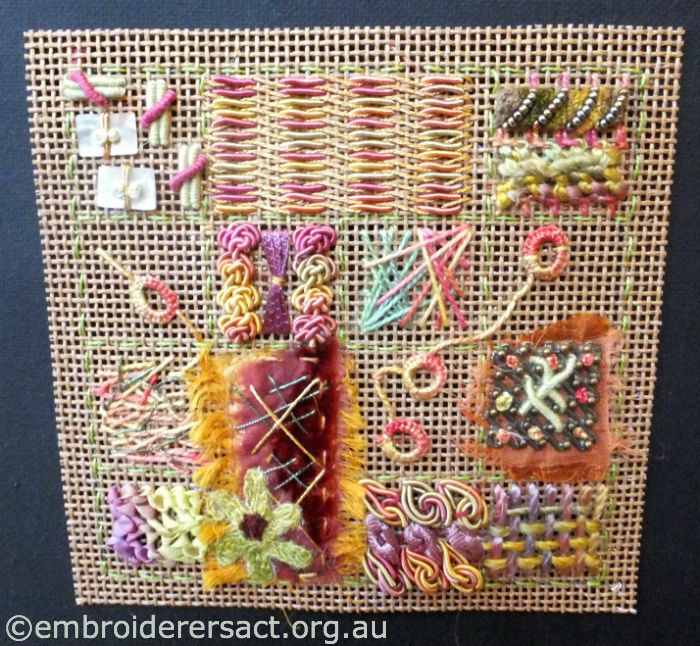 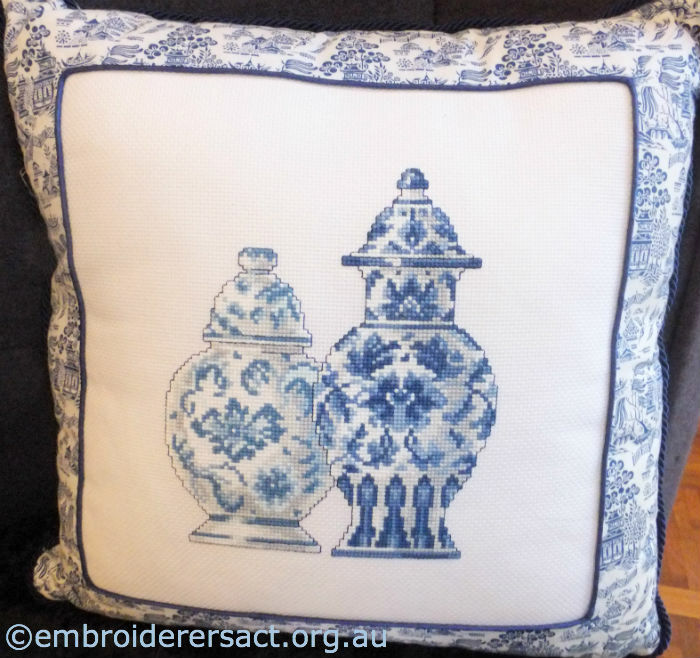 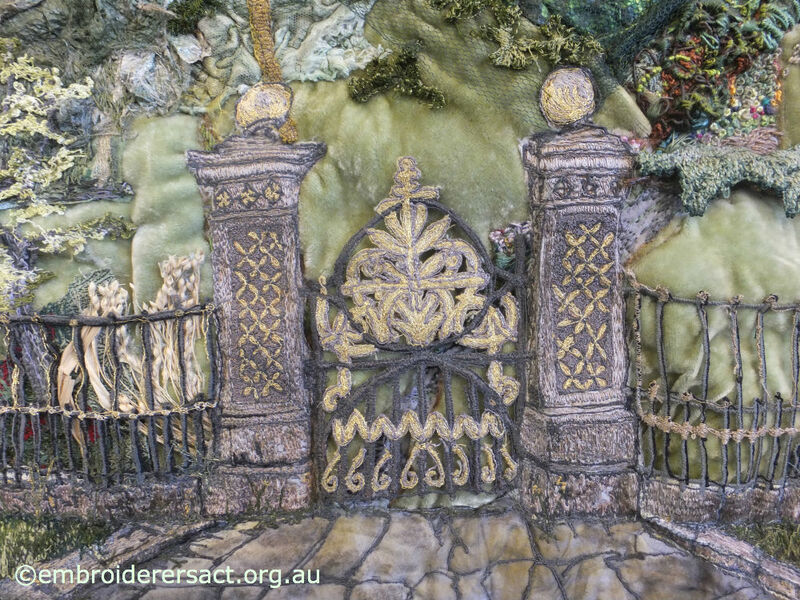 Carol came to Australia from Austria in 1960 and has had a lifelong love of all things creative in embroidery. 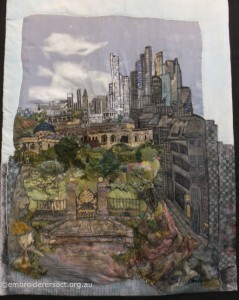 This work My City Lives is large, three dimensional and with a strong architecture. It’s intensely worked and detailed and there’s a surface richness that’s hard to capture in a photo. 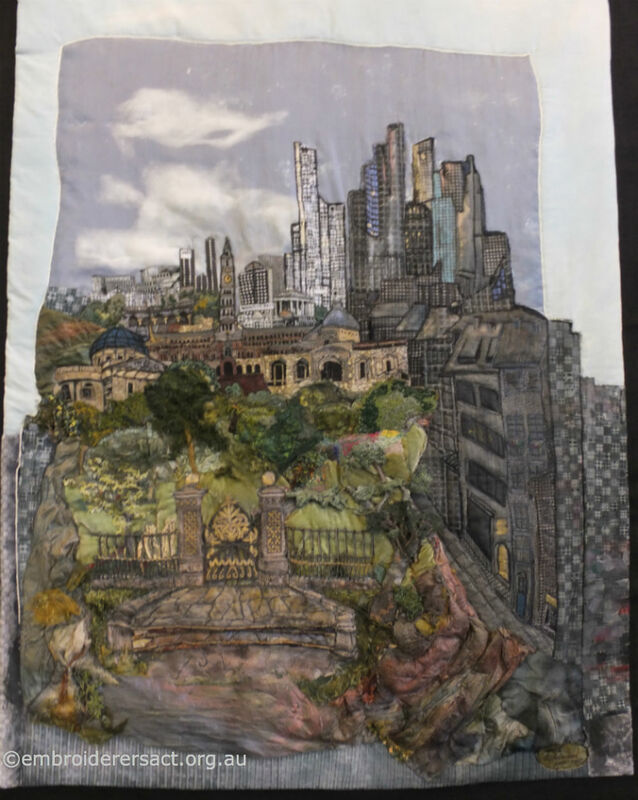 The city itself is a composite of favourite places in cities around Australia that Caroll has visited. 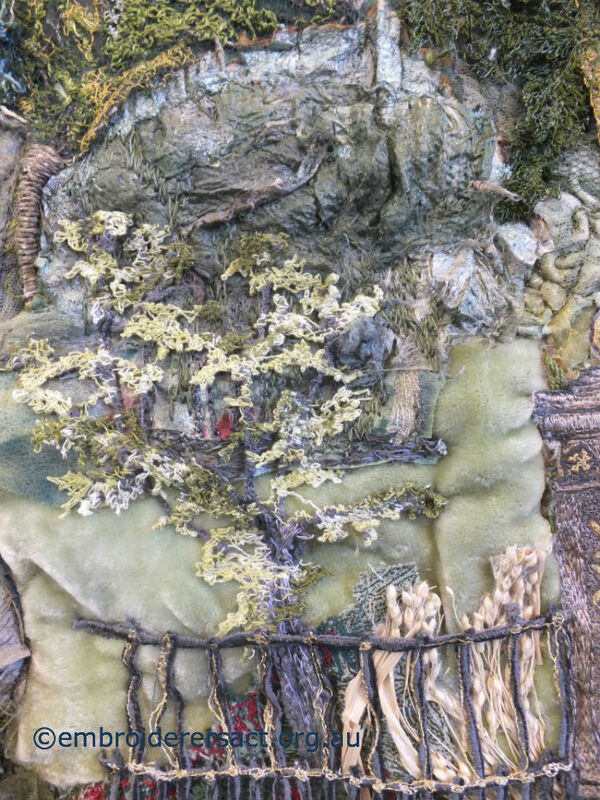 Here are some details that I picked out from the foreground…..
It’s an inspiring and powerful work and it’s been a hit with visitors to the show. What do you think? lid of a small chest……. 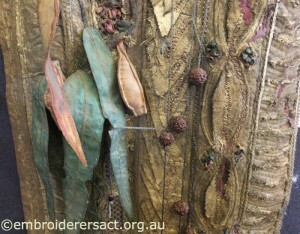 I’ll be sharing more of Caroll’s work in later posts on the Exhibition. And here’s a quick impression of some other work on show…. 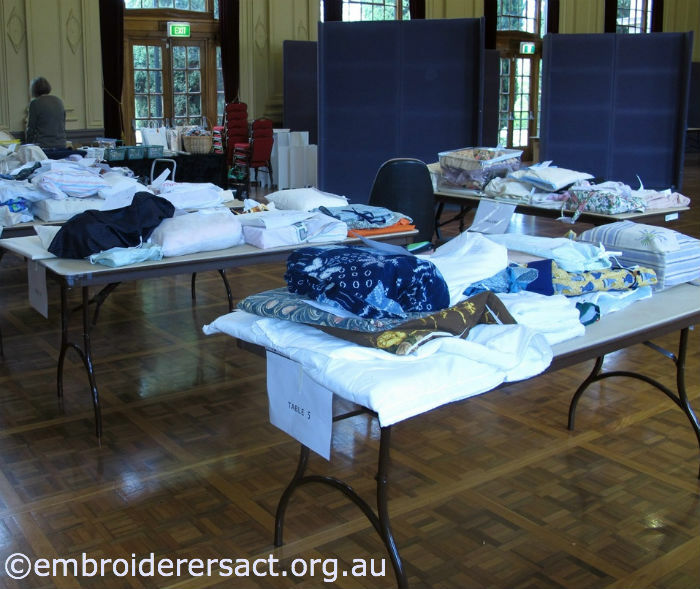 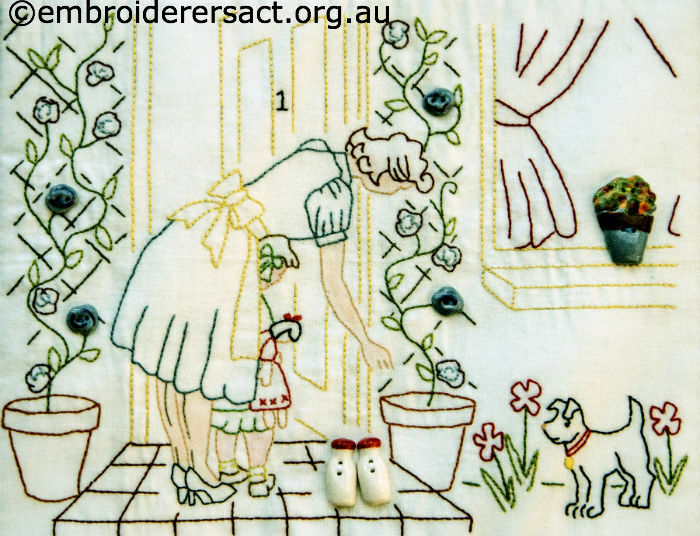 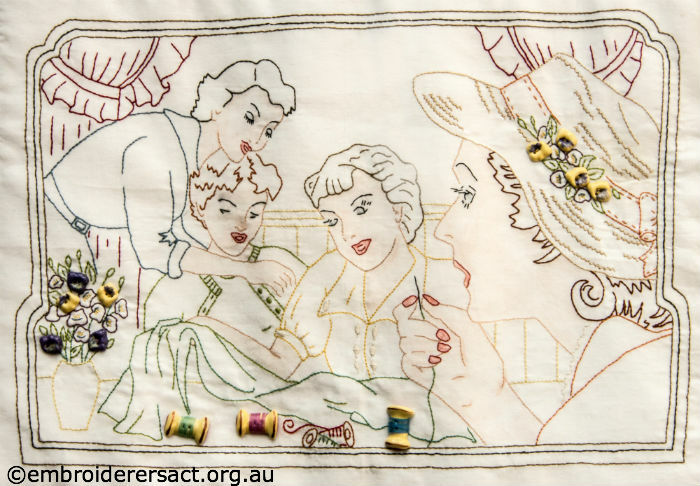 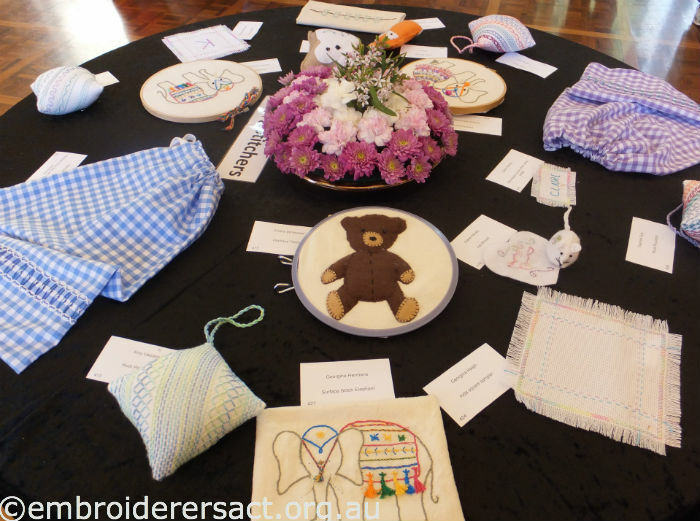 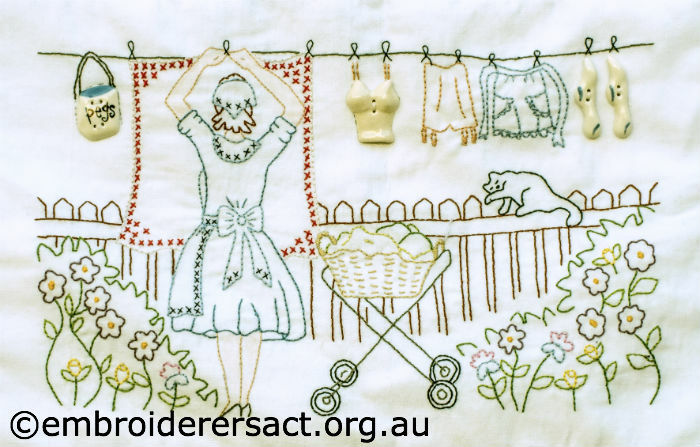 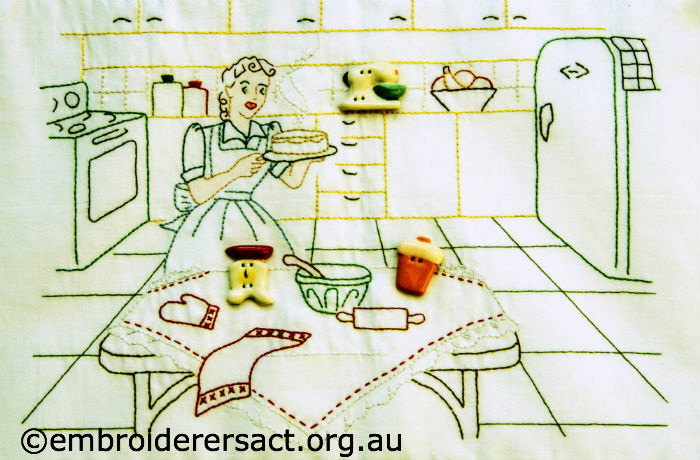 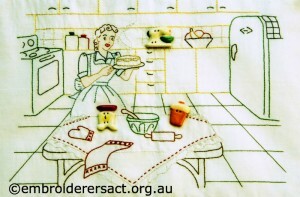 Tomorrow’s the last day of the Exhibition and if you’re in Canberra then make sure you don’t miss out on this chance to see some great stitching…. And when you need a break there’s the cafe’s excellent coffee and the retail therapy of The Gift Shop and the Recycle Table.